THERE is obviously something about Indian textiles. One knows, of course, of their great antiquity, of the magical things that were produced in this land of ours, of the incredible skills that have survived to this day among our weavers and dyers and printers. But every now and then, one also comes across persons whose very world seems to revolve around Indian textiles, who become ‘possessed’, as it were, by them. Among them, two names that are still spoken of with a mixture of awe and reverence among textile aficionados are those of Gautam and Gira Sarabhai, who built, years ago, the dazzling collection that has its home in the Calico Museum of Textiles at Ahmedabad. Rai Krishnadasa, that man of vision from Benares, might have had many other interests, such as Indian painting and Hindi literature, but when he held a great textile in his hand, one could see a different glint in his eyes, sense a flutter in his heart. For some time now, one has also been hearing of the Shahs of Surat – Prafulbhai, and his wife, Shilpa – for whom collecting Indian textiles is something of a junoon, as they say, an unmaada. One knows that they have been actively involved in setting up a museum of textiles in their hometown, where people ‘breathe’ colours and patterns, and "the clatter of looms never lets up". But, candidly, I had very little idea of the quality of the collection they had assembled over the years till I saw a publication of theirs. Should cultural property be returned? Called Trade, Temple and Court: Indian Textiles from the Tapi collection – Tapi being the name of the wayward river that runs through Surat – the volume has within its covers some of the most delightful, and most beautifully published, examples of Indian textiles: shawls and patkas, jamdanis and patolas, pichhwais and palampores, Paithanis and Karuppurs. But also some of those unpretentious but extraordinary printed, or printed-and-painted, cottons that have, for centuries, attracted eyes and minds as far away as Egypt towards our North-West, and Indonesia in our south-east. To go through the volume – and one must do it at a leisurely, thoughtful pace – is to enter, thus, a world of diverse delights. Slowly, it turns into an experience. A walk through the great Calico Museum of Textiles comes to mind. Apparently, the Shahs began collecting in a modest manner, picking up, in the early years, little things and fragments from those unsung heroes of the world of Indian collecting: the phariwallahs, or small-time kabadis, who go around the countryside first, collecting odds and ends, and then peddle them to people with more means, and some taste. But, over the years, as their passion mounted and broader worlds swung into view, the Shahs went about collecting systematically, consulting experts, developing expertise of their own, buying things from high-profile dealers, especially in the western world. One has simply to look at the names of the three authors responsible for the text of this volume – Ruth Barnes, Steven Cohen, Rosemary Crill – or go through the list of persons whom the Shahs mention in their introductory notes, to get a fairly clear idea of the company they have kept in the course of this journey. The "endless discussions, spirited arguments, elation, and disappointment", which the collectors speak of, must have come with the territory. Of evident interest to everyone are truly old Indian textiles, going back to dates earlier than the 17th century, antiques, in other words. But these, certainly those that date from the 15th century or before, and were found in such large numbers once at Fustat in Egypt, are not easy to come by. Not any more. Nor are genuinely early examples of Indian textiles that south-east Asia used to import in enormous quantities and hold almost in reverence. But through a combination of persistence and good fortune, Praful and Shilpa Shah were able to add to the collection some remarkable early pieces, including some which were regarded in Indonesia as "heirlooms" – maa’ was the word used for them, meaning ‘ceremonial textile.’ Among them was a stunning cloth, more than 5 m in length, with monumental printed and painted figures that come straight from Gujarati paintings of the 15th or 16th centuries. One can imagine the endless discussions, and agonising about authenticity and value etc, that must have preceded buying a piece like that. Discussions like these, if they took place, are naturally not recorded, but others are. And one can visualise how these would have so completely absorbed the minds of everyone involved, including almost certainly the collectors. Consider the manner in which Steven Cohen, while introducing the section on shawls in this book, brings in the whole issue of the origins of shawl-weaving in India. He contrasts the two approaches to the subject taken by John Irwin and Moti Chandra, taking no credit away from either of the two researchers. But, trusting Moti Chandra’s information, based upon ancient sources, he dismisses the popular story, perpetuated by Irwin’s writings, that shawl weaving was introduced in Kashmir by weavers from Turkestan in the 15th century, under the famous ruler, Zain al-Abidin. As a raw material for weaving, fine goat hair was known to the Indians much before this, as texts – many of them of Jaina origin – show. For they speak of fine hair (pakshma/pashm) "from which ajakas were made", whatever ajakas were. 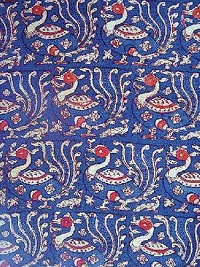 The reference to pakshma/pashm keeps recurring in literature, and when Yuan Chwang wrote, in the course of his travels in India in the 7th century, about ho-la-li, which "was made from the hair of some wild animal and was a fairly costly stuff", he was referring almost certainly to what we call pashmina today, according to Moti Chandra. Whatever the truth of the matter, this is exciting stuff. And one can be certain that the Shahs themselves discussed the pros and cons of the issues with the same passion that they brought to their distinguished collecting. In support of his theory of the early origins of shawl-weaving in India, Moti Chandra cites a passage from the 11th century Kashmiri author, Kshemendra’s Narmamala. It speaks of a teacher who was employed in a Kayastha’s house for teaching the children of the house, and who, "instead of carrying out his duty whiled away his time in spinning (kartana), drawing out the patterns (likhanam), and weaving the patterns on a strip with an eyeless wooden needle (suchipattkavanam)".